Jackie Crow jogs and smiles when she delivers Amazon packages from her car to front porches. KANSAS CITY, Kan. -- Jackie Crow jogs and smiles when she delivers Amazon packages from her car to front porches. Jackie calls it her at-work, workout. 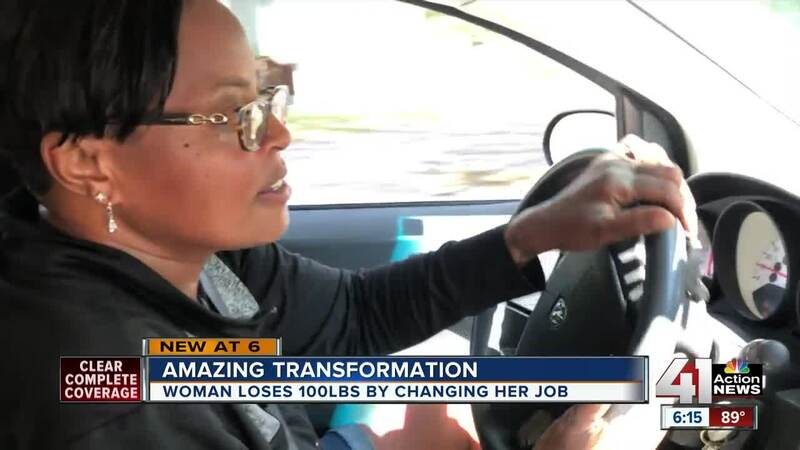 She came up with the concept of making her job a workout because three years ago, she weighed 300 pounds and decided it was time to lose weight. "I wear long sleeves in the hot sun and sometimes I'll park a longer distance from a house so I can jog a longer distance," explained Crow. "I don't need to be sitting at a desk. I don't want to be in an office... and Amazon was the missing piece that I needed to stay active," said Crow. She lost 100 pounds in 18 month-- slimming down from a hefty 300 pounds to 198. "I feel great. I have more energy, I'm active, I don't need a walker anymore," she added. Amazon Flex allows drivers like Crow the flexibility of picking their own work schedules. Crow said that flexibility helped her have time for family, exercise and helping with the family business, Wilson's Pizza and Grille. She said the extra money from her job helps her pay for her son to attend college. More information about the program is available on the website.